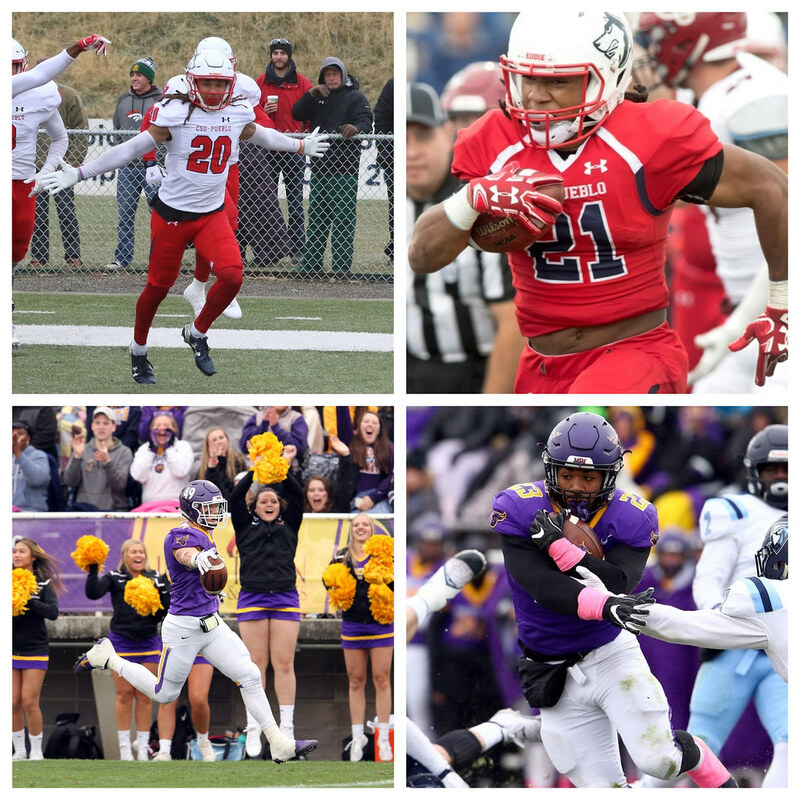 The two squads have some history with CSUP upsetting MSU in the 2014 D2 Championship Game in Kansas City 13-0. The Mavs then got redemption a year ago in Mankato outlasting the TWolves 16-13 (OT) in a playoff opener. With both teams playing in similar weather, and the highs being around 30 degrees, I don't see the weather being much a factor for either team. CSUP is a run heavy attack that thrives off the turnovers produced by their defense. The ThunderWolves utilize a slew of running backs. The main guy is Marche Dennard, who was also their top back a season ago. Dennard is a physical runner who can find the end zone with open space, scoring twice from 40 plus a week ago. The CSUP offensive line is massive and does a nice job of providing room for Dennard and company to operate. Former 1,000 rusher Bernard McDondle (SR) is part of the Wolves stable but is still getting over losing a chunk of his career to injury. CSUP averages 264 rushing yards and 156 yards passing per game. Quarterback Brandon Edwards (SR) played a year ago in Mankato in relief duty but has been the starter all of 2018. Edwards is 6’2 and 211 lbs, a pocket passer who isn’t quick enough to escape the rush. He attempts just 19 passes per game, completing 57% with 11 scores and only 1 interception. This offense is meant to be a ball-control bunch that plays safe football, while winning the line of scrimmage. 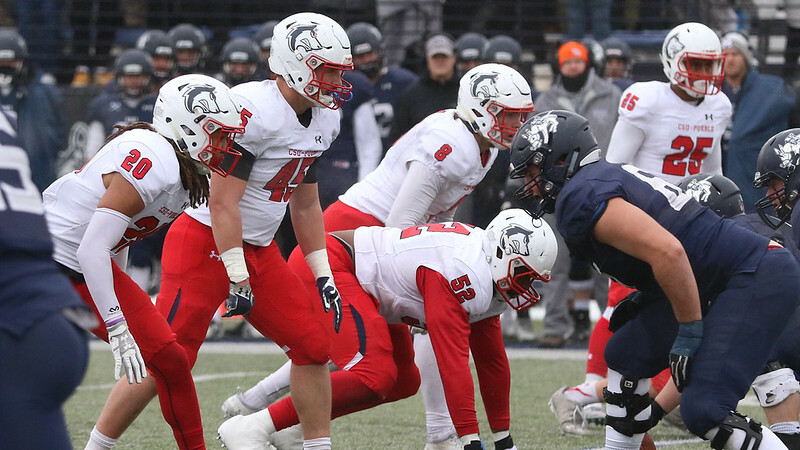 The CSUP defense is far and away the top unit in the Rocky Mountain Athletic Conference (RMAC). Pueblo isn’t the top defense statistically in D2 football but considering the diverse and explosive offenses the T-Wolves face in the RMAC, they could be as good as any stoppers in the country. CSUP plays a 3-man front and all 3 of the down lineman can disrupt an offense. The trio has 25 sacks as a group. Devon Sizer (NT) is the anchor. While a nose tackle often times eats up space for others, Sizer makes a lot of plays himself due to his agility. The top tackler for this stout defense is inside backer Brandon Payer, the RMAC DPOY. Possibly the best part of this defense is the ability to create turnovers, putting the offense in position to score points. CSUP led D2 in turnover margin at an eye-popping +26. 25 of those takeaways were interceptions including 5 pick sixes. The leader of the secondary is Darius Williams who can line up almost anywhere. Williams played corner a season ago and now covers the slot. He is often sent on blitzes and ends up being all over the field. A year ago, Williams and company limited MSU WR Shane Zylstra to just 1 catch for 22 yards, as the Mavs completed only 7 of 18 tosses. Pueblo allows only 2.1 yard per carry and just 3.4 yards per play, both D2 bests. This Pack D is the real deal. Their volume of interceptions instills immediate fear in an opposing quarterback looking to take shots against them. A top ranked offense (Colorado Mines) was able to hit some big plays against this Pueblo defense in round one but overall CSUP had its way against their in state rival. The Mavs look much the same from last year, talented and young. MSU continues to split time between two quarterbacks (Schlichte and Ekowa), going with the “hot hand” in closer games. Schlichte is more the gutty leader who throws a nicer ball. Ekowa is more the dual threat signal-caller who can get chunk yards in the zone read running game. The Mavs like to keep teams guessing but I’m predicting Ekowa will get more time in the postseason, as he makes a defense account for another potential runner. Ekowa probably doesn’t offer the Mavs quite as much in the passing game, but I think MSU will look to play things conservatively against the stellar CSUP defense. I suspect they’ll try to be more diverse in the running game instead of challenging the top ball-hawking secondary in D2. Like CSUP, the Mavericks have a big offensive line that looks to establish a physical tone. Nate Gunn hasn’t been quite been as productive in 2018 but is still a strong runner between the tackles who can tote the rock 30 times a game. MSU has a game-breaker at wide receiver in Shane Zylstra, whose athletic 6’5 and 220 lb frame can be a difficult matchup for smaller defenders. Zylstra has been the top wideout in the Northern Sun the last few seasons because of his ability to out-athlete defensive backs on 50/50 balls, often resulting in scores. The Mavs have also seen the emergence of Justin Arnold (WR). Arnold helps shoulder the receiving load while also helping the Mankato get out on the edge by running jet sweeps a few times a game. 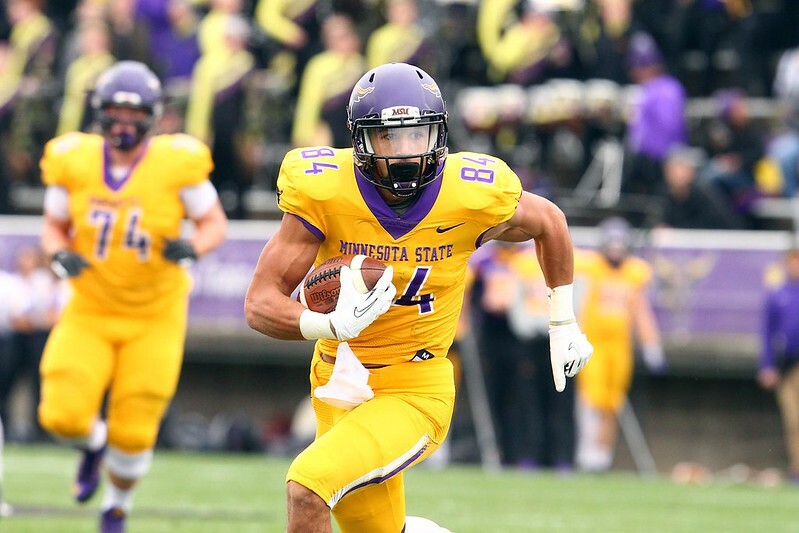 The Mavs D isn’t on the immediate conversation for being the best unit in the country, but is still one of the NSIC’s best and is very good against the run. The ability to get to the passer helps the secondary, which had shown signs of being a weakness. For those who’ve watched Mankato the last handful of years, the 2018 unit possesses nearly the same type of identity. MSU limited USF’s Gabe Watson (top rusher in D2) to a season low 106 yards. MSU is strong at the point of attack and that all starts with possibly the top defender in the NSIC this season, tackle Zach Dodge. Dodge routinely takes on multiple linemen and still finds a way to disrupt the offense. The Mavs allowed 500 yards through the air against Augie in September, easily their worst performance of the year. Dodge missed that contest due to injury. Alex Goettl is the top playmaker, leading the club in both tackles and tackles for loss while adding 2 interceptions. The Mavs front seven has limited every running attack they’ve faced, allowing 2.61 yards per attempt. 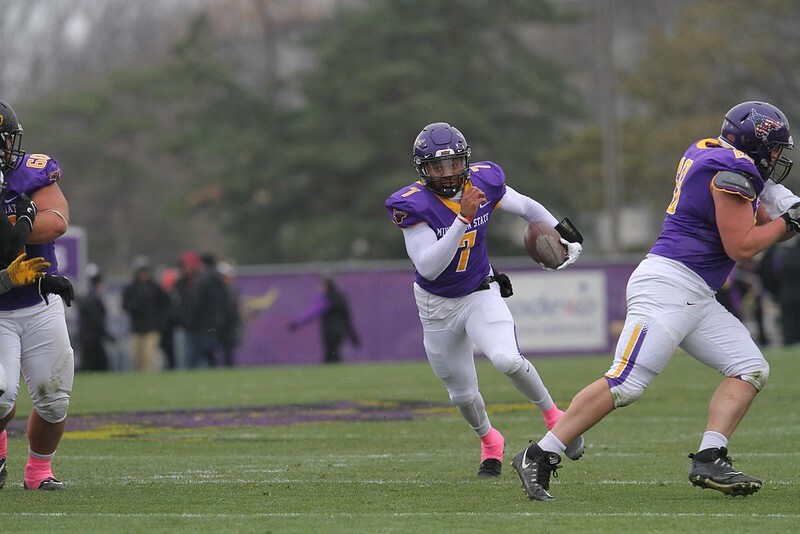 The young Maverick secondary improved as the year wore on but in a NSIC Conference that didn’t have many established passers, the Mavs faced few playoff caliber air attacks. CSUP won a week ago in cold and miserable weather at Colorado Mines, 37-17. The ThunderWolves avenged an earlier season loss to Mines in fairly dominant fashion. The defense had 2 pick-6’s by the middle of the contest. That was much needed as CSUP experienced trouble offensively. CSUP hit on two running plays for 40 yard scores in the second half, widening the gap and securing the win. In watching the game, I walked away impressed with CSUP’s outstanding D but felt the Pack offense was challenged. Mines doesn’t have a top defense but gave Pueblo problems. The Kato defense is better than the Mines D. MSU limited CSUP to 5 first downs and 149 total yards of offense a year ago, and while the Wolves have a different OC, QB, and are healthier offensively, they are still a running team and that plays into the strength of the Kato D. CSUP QB Brandon Edwards struggled in his 3 regular season contests against playoff competition this year completing just 49% of his passes with 1 interception and 0 touchdowns. Since he’s not terribly mobile, expect MSU to get after him with its pass rush. Nate Gunn ran for just over 100 yards a season ago when these squads met, but it took more than 30 carries. With backup and former 1,000 yard rusher Justin Taormina injured, it’ll be important for the Mavs to keep Gunn healthy as they lack depth. This is also why I expect to see more of Ekowa (pictured below) at QB, helping with the running attack. I think the Mavs will struggle to have consistent success in the ground game and must be very cautious taking shots downfield against CSUP D. A week ago CSUP limited a good Mines running attack to 37 yards on 37 carries. I believe all of this leads to a conservatively called game where both teams try to run the football often and conduct their offense in a very careful manner with points likely at a premium. The ThunderWolves are sound in the kicking game, but Casey Bednarski is a flat out weapon for MSU. Before digging into the teams, I expected to pick CSUP. The 37-17 win over Mines gave me the immediate impression the TWolves might be too much (as I knew how good their D was) for Mankato. However, after watching the game and seeing the Pueblo offense, I don’t think MSU is a favorable matchup offensively. I’m giving the slightest of advantage to the Mavs for being at home, the tipping point being the playmakers Mankato has with All-Americans Gunn and Zylstra. This game could very well be a 10-6 type but I assume we’ll see a few key turnovers that move the point total up a bit from there. After watching first round film of both teams, this is a difficult game to call. Commerce is so athletic and makes plays on both sides of the ball, sideline to sideline. The Lions also play with a certain playoff swagger that makes them look at ease this time of year, while their opponent often looks like it is playing tight. Tarleton has looked bulletproof this year and showed how complete a squad it is with a 58-0 trouncing of Azusa Pacific a week ago. Given how well Commerce has played during the playoffs in recent years, you simply cannot count them out but based on the way Tarleton handled TAMUC earlier in the year, I think the Texans are hungry enough to assert themselves again.